The tops and leaves consist of superb curl mahogany mirror veneers with a moulded edge, the top having evidence of slight movement due to shrinkage of the boards below but the tops remain flat. The leaves are also veneered to the underside as due to their length the underside is visible. This leads down to two curl mahogany veneered drawers with birch linings, a central turned wooden escutcheon and brass star shaped handles, the drawers having locks with keys and the backs of the tables having a curl veneered rail. 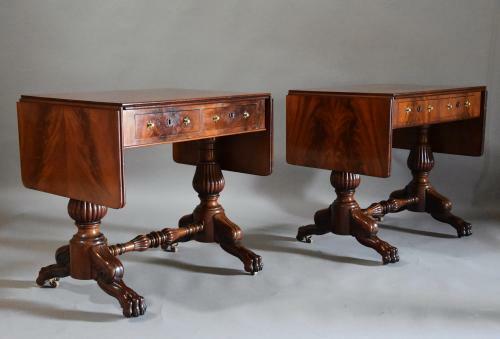 Each table has two turned and reeded bulbous supports leading down to stylised animal legs and paw feet in the typcal style of early-mid 19th century French furniture, the legs being supported by a turned and reeded mahogany rail and supported on castors. These tables are of superb quality and it is rare to find a pair of this size, quality and condition, they are of stable construction and can go staright into a home.